Chicago, the birth place of house music, has had its share of clubs and underground parties, but the roof top of the Grand Ballroom at Navy Pier was not one of them until last weekend. 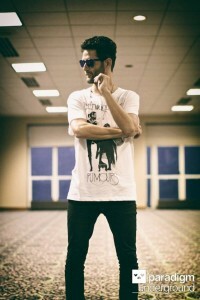 On Sunday, August 25th, promoters Paradigm Underground organized a label showcase party dubbed “Rumors on the Pier” celebrating Guy Gerber‘s new label Rumors. Accompanying the Israeli at the decks were two Detroit power house DJs: Moodymann and Delano Smith. From 2 to 11 PM attendees got to enjoy perfect weather for a great outdoor event. Getting there was a little tricky, but after talking to a few people I was pointed in the right direction and told to listen for the music. Approaching the hall I looked up and could see people dancing, and that the music was loud. I was surprised at the size of the roof top, it was massive. Multiple bars serving drinks at a much lower price than was expected. Plenty of seats on the side to sit and relax. The perfect skyline view was only made better by the visual effects the party goers were treated to by a fireworks show. By the time I made it to the dance floor Delano Smith was mid way through his set playing some sick tech house and minimal techno. Moddymann gave us a vinyl-only set filled with funk, disco, and Italo tracks that I hadn’t heard in years. When he played My Mine’s “Hypnotic Tango” I knew for sure it was gonna be a fun night. I mingled and mixed and even made some new friends. After a few drinks the time had finally arrived, Guy Gerber was on stage. All night everyone was wondering what kind of set he would set he would play. All our questions were answered immediately. From the start to finish he played nothing but heat. The songs blended perfectly and all we could do was dance. You know it’s an aweome set when you don’t want to leave and grab a drink. The music was just too good. As Guy closed his set, I realized that I had just been part of something special. It was 11pm on a Sunday at Navy Pier, the dance floor was packed, and house music was blasting. Was I in Europe? Hopefully this was the first of many roof top parties to come. Thank you Paradigm Underground and all of the DJs for making it a Sunday to remember. Photos by Matthew Reeves for Paradigm Presents.